Welcome to the Bits 'n Bolts blog. On this blog I will write about my learnings & findings during the development of projects for both myself and my clients. But before I discuss the things that I see and do, let me do a proper introduction of myself. This is me: Thijs van den Anker (aka thijsvdanker at drupal.org). But when I open my MacBook, or boot my Linux machine (and take of my glasses).. I Am Bits 'n Bolts! Becoming Bits 'n Bolts didn't happen overnight. My professional career started when I graduated from university in 2007. I went to join two of my friends and became a partner in Dooping, a creative web-agency. After working on a homegrown CMS for some time, we decided to join the Drupal community (5.x at the time) and for a couple of years crafted a wide range of websites using Drupal. Summer of 2010. Tim, one of my partners at Dooping, woke up after a great night of sleep in which he had a dream: walking around in a museum in where all paintings had a physical Facebook like button. That was the beginning of Fuzeo where I and four others chase our vision of connecting the online and the offline world. My role in Fuzeo is software development lead: making sure we are working on the right things, in the right way. Connecting online and offline worlds means dealing with people and their interactions at events. We developed a platform that supports these interactions in a customizable way. Drupal is a key part of that platform. Fuzeo is a great adventure, and a dream worth pursuing. That's what I wanted to tell you about me. I'm not all work, no play. But that's not why you're here, is it? 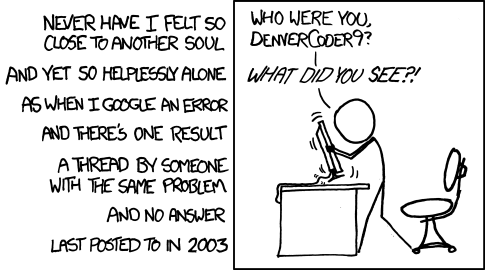 I really want to help the guy in the comic, and not be another DenverCoder9. That is why I blog. I guess that is it for now. Enough about me, let's talk about us! :) Let's have coffee, because I would love to hear your story.